This past week there was a Groupon for sewing lessons in Loomis. When I clicked on the Groupon and read the details, I saw that the store hosting the lessons was called The Tin Thimble. Immediately, I remembered that I had met a lady in my Bible Study class who owned a store with that very name. Anthony insisted on buying the lessons for me and I had the chance to visit the store yesterday with a friend of mine. 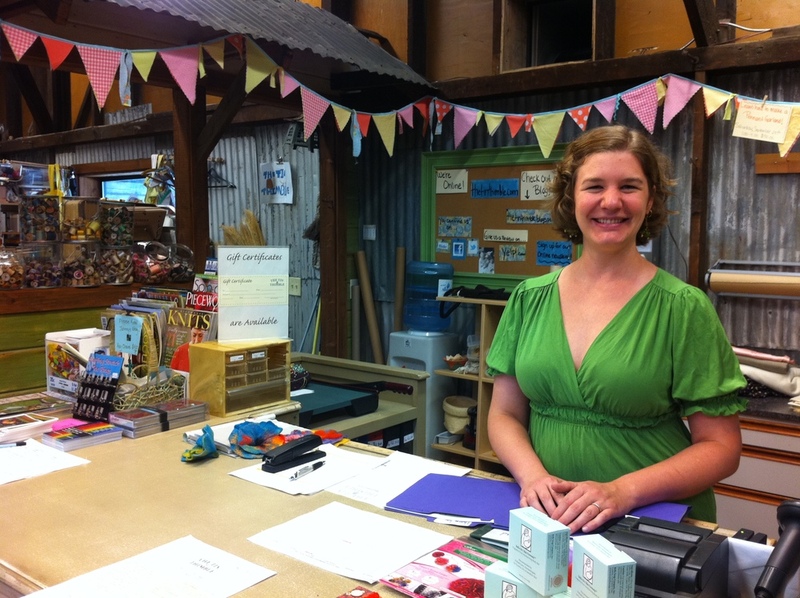 The Tin Thimble is a shop located inside High Hand's packing shed. It reminded me of an antique version of the American Tin Cannery in Pacific Grove, CA. Before going into The Tin Thimble, my friend and I enjoyed a delicious brunch at the High-Hand Conservatory. It is one of the cutest nurseries and restaurants I have ever been to. They have lots of plants for sale and specialize in Monrovia plants, which are one of the highest quality plants (thanks to my friend for this info!). The restaurant serves local eggs and meat that is locally grown and free ranged. Local eggs, homemade sausage & scone, strawberries, & potatoes. Delish! Once our bellies were full from the delectable food, we strolled through the High-Hand shops and found The Tin Thimble. Upon entering the store, I informed my friend that this was going to be a money pit for me! It is full of high quality fabric bolts, buttons, yarn, patterns, antique machines, sewing notions of all kinds, etc. Lovely items that I can't wait to explore (aka buy) even more! Fortunately, I had planned on visiting the store, so I brought cash to spend (thanks to budgeting). The store is set up with lots of shelves that form little rooms, but they all open into the main walkway. In the back of the store, we found my friend, Emma. She is incredibly helpful and very friendly. She quickly assisted the other customers who were shopping, as she gave us a listing of all the classes they teach at the store. I was very impressed that she knew the customer's names and greeted them with a cheery smile. She helped my friend and me choose which classes to take based on our level's of sewing knowledge. She also recommended a local sewing machine repair shop for my friend's machine. I really appreciated Emma's expertise regarding the whole sewing industry. I signed up for three classes: one on making a tote bag, another about getting to know your sewing machine, and one on making a pennant (an example of the pennant is above Emma in the picture). Thanks to The Tin Thimble's blog, I had read that they just got in their Christmas fabric. My pennant is going to be an old fashioned Christmas one! I can't wait to take the class and show you all how it turns out. Button, the store's newest employee! While we were there, a Nuno felting class was being taught. Emma informed us that Nuno is an agitation technique that combines raw wool onto silk or cotton fabrics to make new pieces. To get more details on this, you will have to visit the shop and ask Emma. The ladies in the class seemed to be having a really fun time, who knows, I might just end up taking a class on Nuno felting next. I can't say enough wonderful things about The Tin Thimble. Please take some time and visit it, I know you'll love it!